Gadolinium-based contrast agents (GBCAs) have revolutionized magnetic resonance imaging (MRI) by increasing the clinical utility and detection sensitivity of these exams. GBCA-enhanced MRI exams often provide clinical information that cannot be obtained from an unenhanced MRI or any other diagnostic imaging exam. In this way, GBCAs have profoundly improved medical care worldwide by improving the accuracy and expediency in obtaining relevant information that can be used to diagnose, treat, and cure human disease. Approximately 50% of all MRIs are performed with intravenous GBCA administration. Since initial approval from the U.S. Food and Drug Administration (FDA) in 1988, more than 450 million GBCA doses have been administered worldwide. 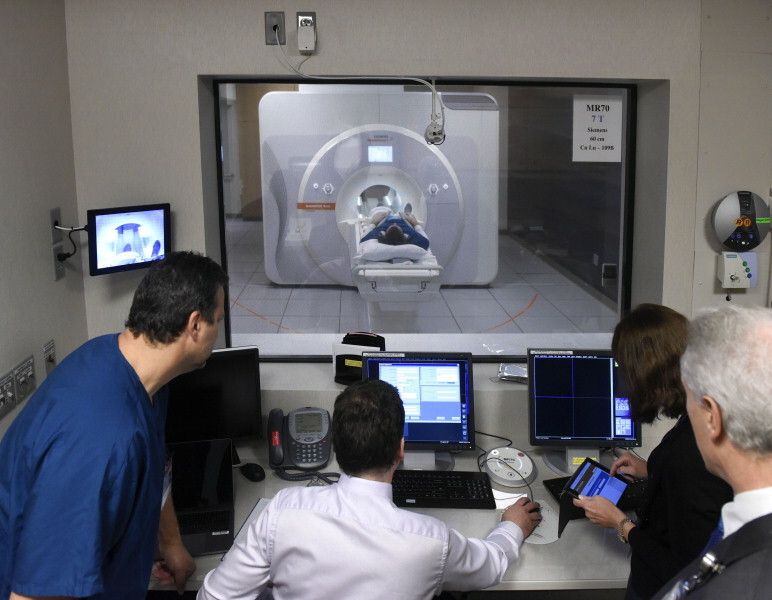 A patient is examined via MRI on the Charlton 7 Radiology Unit at Mayo Clinic in Rochester, Minnesota. GBCAs all contain gadolinium, a rare earth metal with unique chemical properties that increases the conspicuity of diseased tissues. However, the recent discovery of small amounts of retained gadolinium in human brain tissues following intravenous administration of GBCAs used during routine MRI exams has caused concern among patients, physicians, scientists, and regulatory agencies. These findings have attracted a great deal of media attention and have focused on the potential adverse health effects to chronic gadolinium exposure. The recent concern coincides with an FDA announcement in December 2017, when the agency recommended a new class warning and other safety measures for all GBCAs used for MRI exams. This warning was fueled by recent evidence that gadolinium can be retained in the brain (and other body tissues) for months to years after exposure. 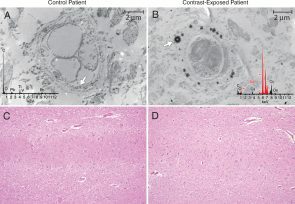 It was a Mayo Clinic research team that, in a 2015 study published in Radiology, retrieved archived tissues from the Mayo Clinic Biorepository within Mayo’s Biobank (one of the largest resources of its kind) to determine whether or not repeated doses of gadolinium from MRIs caused any type of accrual of the metal in neuronal tissue. The FDA endorsed the study findings during its review process. Since then, Mayo has done a series of groundbreaking studies on gadolinium retention, led by Dr. McDonald. For the most recent 2017 study (presented at the Radiological Society of North America’s 2017 conference), researchers wanted to create very practical parameters that represent the typical patient. Hence, their study asked the question . . .
What Happens in MRI Patients after Several Doses of Gadolinium? Whether or not patients are exposed to GBCAs for an MRI scan is based on clinical assessment of each individual’s risk and tolerance profile. To conduct this investigation, the team took advantage of the Mayo Clinic Study of Aging (MCSA), a longitudinal population-based study on cognitive changes related to aging. It is the largest and most comprehensive study on aging in the world. “We realized this was the perfect study to determine if chronic GBCA exposure was detrimental to neurologic function because it was a longitudinal population-based study, unlike any other in the world, with a comprehensive neurologic exam performed on thousands of patients at regular intervals. Fortunately for us, the MCSA happened to be inadvertently studying gadolinium deposition as well,” says Dr. McDonald. By separating out these particular MCSA patients, Dr. McDonald’s team was able to study 4,261 cognitively normal men and women, between the ages of 50 and 90, with a mean age of 72. All of them underwent extensive neurologic evaluation and neuropsychological testing. 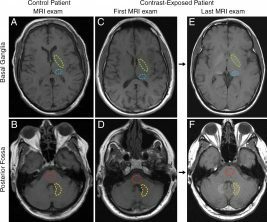 Their scores were compared using standard methods between MCSA patients with no history of prior gadolinium exposure and those who underwent prior MRI with GBCAs. The mean length of study participation was 3.7 years, and the median time since first gadolinium exposure was 5.6 years. “We view this as a preliminary study, but so far, we’ve found no evidence that gadolinium retention in the brain is associated with cognitive decline or adverse clinical outcomes,” says Dr. McDonald. “Our study is ongoing because the burden is still on our field to better understand this retention phenomenon. We need to foster collaborative efforts abroad to better understand the safety of all commercially available GBCAs to render the best and safest care to all patients. That’s what really drives us to do these studies,” he adds. 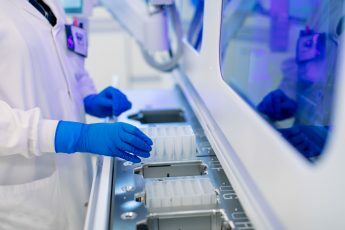 Because prior investigations on gadolinium exposure by the FDA and the European Medicines Agency have been largely limited to adults, Mayo also conducted a smaller case-control study in 2017 on a cohort of pediatric patients (under age 18) who had received at least four gadolinium-enhanced MRI exams. The study wanted to determine if young patients also retain gadolinium, or if perhaps their youth made them more immune to it—given that gadolinium is suspected to enter the brain by circumventing the blood-brain barrier, which breaks down as individuals age. Unfortunately, youth doesn’t seem to confer an advantage. The study confirmed the presence of intracranial gadolinium deposits in pediatric patients with normal renal function. And, as with the adult population, the gadolinium deposition seems to follow a dose-dependent trend. Why Do Some Patients Retain Gadolinium While Others Do Not? Diluting patient samples for analysis. 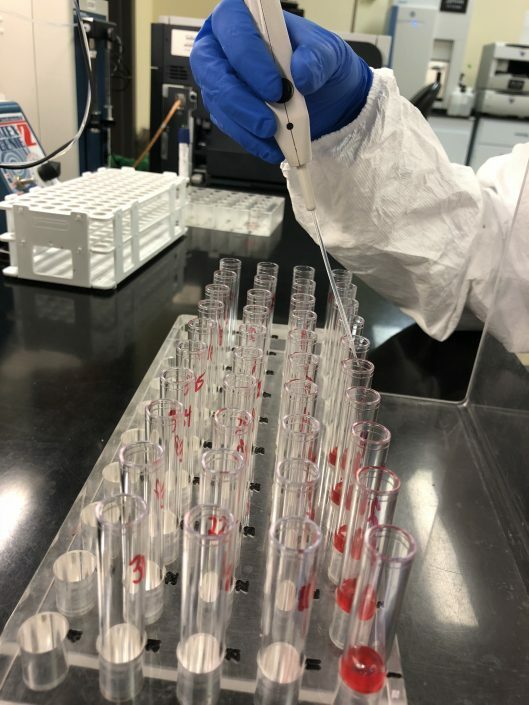 The Metals Laboratory has one of the few ISO 7 class cleanrooms for trace metal analysis of its kind, which minimizes potential contamination to a patient sample. And the lab’s inductively coupled plasma mass spectrometer (ICP-MS) technology provides greater sensitivity, dynamic range, and specificity for elemental analysis compared to traditional atomic absorption techniques. 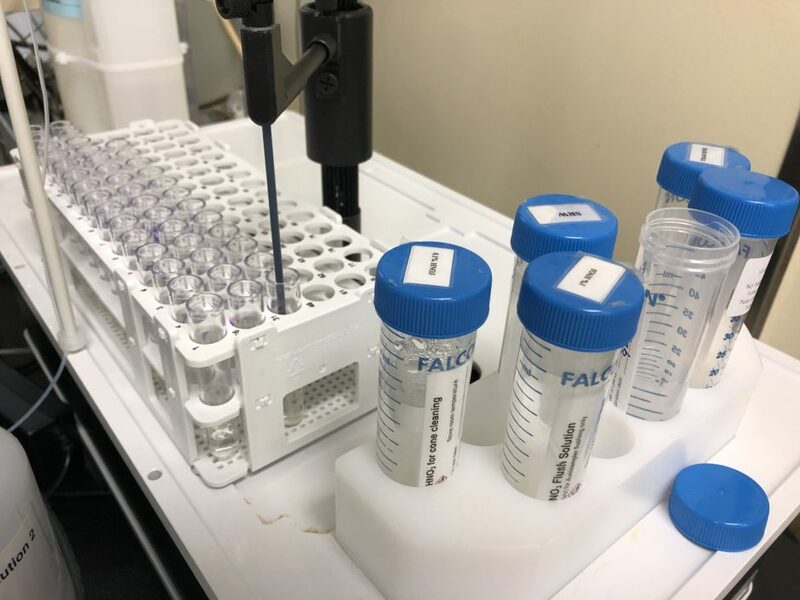 Because of the recent FDA and media attention, the Metals Laboratory has seen a sharp uptick in demand for gadolinium testing. The lab continues to collect data from living subjects who are being exposed to gadolinium, which can be studied to further the literature. It is also supporting tissue studies from Dr. McDonald’s team. 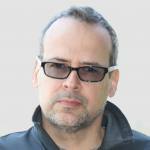 “A systemic exploration of the pharmacokinetics of long-term gadolinium retention is needed,” says Joshua Bornhorst, Ph.D., DABCC, FAACC, who co-directs the Metals Laboratory with Dr. Jannetto. “Our lab is in a unique position to support that, either with collaborative studies here at Mayo, or with other institutions. We want to help facilitate these studies, so we have a better understanding of the science behind gadolinium and can provide better patient care and treatment in the future,” Dr. Bornhorst adds. Currently, there are two types of GBCAs used to enhance MRIs: linear and macrocyclic, and each has their own type of organic molecule that binds (or chelates) with the gadolinium metal. Of the two, linear agents bind less tightly to the metal, resulting in more retention of gadolinium in patients, versus the newer, more stable macrocyclic GBCAs. Regardless of which compound an institution chooses, the FDA has approved the use of both linear and macrocyclic agents as safe and effective with MRIs—which means the agency does not recommend one agent over the other. Dr. McDonald believes that both agents are safe. As noted earlier, since 1988, more than 450 million doses of gadolinium have been administered for MRIs throughout the world. 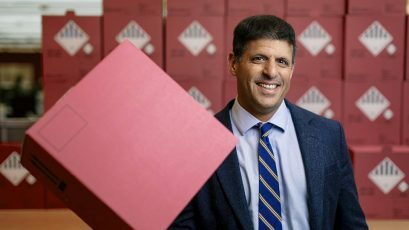 On one hand, a person could say that the big population experiment has already been performed, what with that many doses spanning three decades without any proven adverse effects. Further, gadolinium is present in many municipal water sources, which means some of us may have low concentrations of this metal already in our bodies. In other words, people shouldn’t avoid having a contrast-enhanced MRI. The benefits are profound compared to any potential theoretical risk. Thank you for the information you send us.